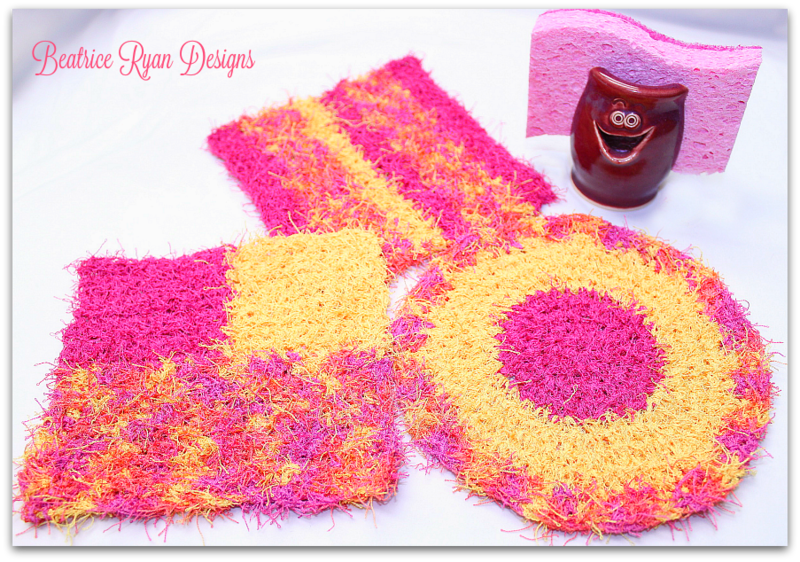 Cheery Kitchen Scrubby’s… 3 Free Crochet Patterns!!! Happy Mother’s Day to all my fellow crochet friend’s!! As a gift to you I made 3 new free crochet patterns to celebrate you and all of the mother’s we love… You still have time to whip these up as a fun gift for the mother you love!! Using Red Heart Scrubby yarn, these work up quickly and are the perfect dishcloth to cheer up the kitchen!! Row 21: Turn, Sl St in each st across. Row 21: Repeat row 11. Round 7: Ch 1, turn, 2 sc in 1st st, sc in next 5 sts, * 2 sc in next st, sc in next 5 sts*, repeat * * around, join with sl st. = 56 sc. Congratulations!! You now have 3 brand new Cheery Kitchen Scrubby’s!! Totally Triangle Dishcloth… Free Crochet Pattern!